Thanks for the contest, I read the blog all the time. My submission is not a picture of an arsenal of different weapons, or even a pic of a certain set of weapons. I have only included one item, although trust me, I have many more. My choice is a knife. But not just any knife, a very specific knife. I have reviewed and tested this knife extensively, and am very confident in its abilities. 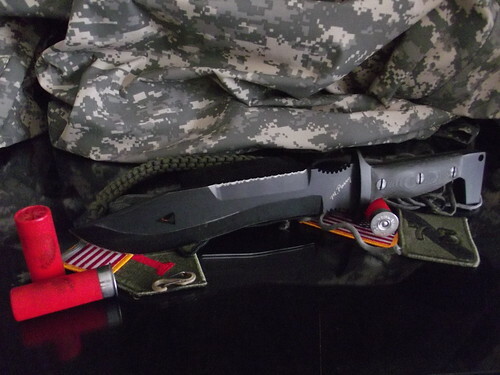 My choice is Mel Parry's "The Brute"
This knife is pretty awesome. It has a quarter inch thick blade, and a very aggressive shape. I will not link to my review of this knife, as I don't want to steal traffic from this excellent blog, but trust me when I say I have tested this knife extensively. It had no problem penetrating a 1/8" thick piece of laminated sheet steel, and I doubt that a similar stroke would have any difficulty stabbing through a decaying skull. I know all of the complaints about using a knife as a fighting tool, but this is a calculated decision. This blade is heavy enough for skull cleaving, light enough to carry all day, and shaped properly for chopping and stabbing. Besides that, if I needed something different, look at my photo props. Can you guess what my primary would be? I apologize for my long winded explanation. Have a good one. Editor's Note: My guess for the primary: a rolled up wet towel. Man, those make for nasty whips! Second guess: pump action shotgun.